Let’s be honest, veggies aren’t always at the top of everyone’s culinary lust list. When you’re thinking of indulgent meals many other things come to mind. Succulent steak, crisp bacon, and all things deep-fried. But the older I get, the more I realize that there are other options out there that make veggies more fun. Especially when my body craves them after a gluttonous Easter. Who’s with me? My latest experiment? Veggie burgers! I recently discovered Wholly Veggie patties –and the options are endless. I’ve had these in salads, in wraps, and in this latest version, as a burger. And no, this isn’t a promoted post, it’s really how much I love them. Combine this with my tangy yoghurt-dill dressing, and you’ll be asking for seconds! 1. In a medium bowl, combine the yoghurt with the mayonnaise and stir well. 2. Add the finely chopped garlic, followed by the dill. Stir until combined. 3. Finish off with the splash of lime. 1. Toast the buns or grill them for extra crunch. 2. Grill your Wholly Veggie burger in a pan or on the BBQ, until you have some nice, golden-brown grill marks. 3. Start your layering with the red kale, followed by the parsnips. 4. Add the patty, then a slice of blue cheese. 5. Top off with a tablespoon of the sour cream dill dressing, and the red onion. 6. Sandwich all the good stuff with the top part of the bun, and bite in! Do you have a favourite way to make veggies a more enjoyable part of your diet? Now you don’t need a fork and plate to eat your dessert, you can just drink it instead! Get the full flavour of your favorite cakes, loaves, and pies but in smoothie form. They have no added sugar, and can give you that extra kick of energy and nutrition to get your day started or boost you during that mid-afternoon (post-lunch) slump. On the menu this time? 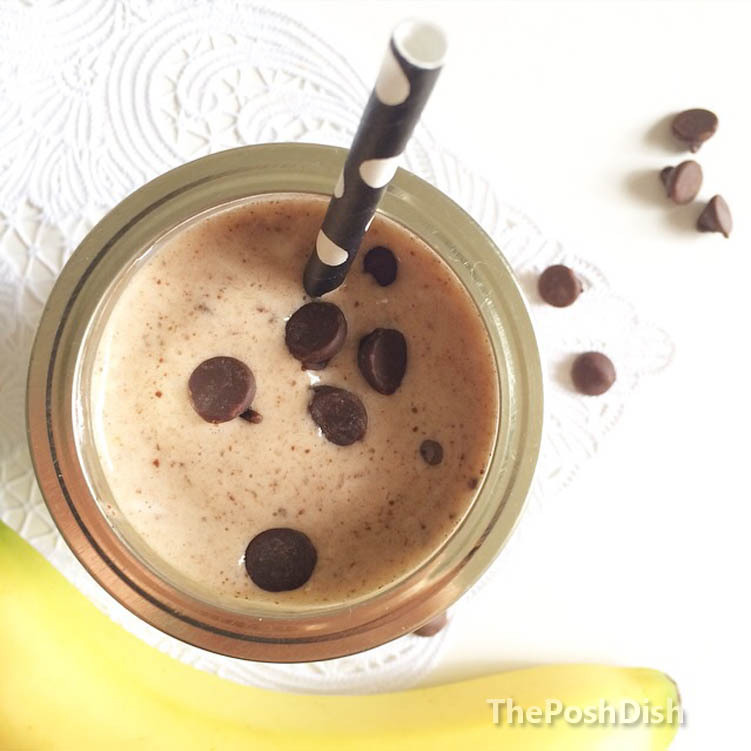 A chocolate-chip banana bread smoothie. All you need are some quick basic ingredients and you’ll have it ready in minutes –no baking required. Now you’re set to sip your dessert –guilt free! With hearty toppings, a warm crust, and the gooey goodness of cheese, pizza is everybody’s favourite! It’s also a food for every occasion –the perfect movie night companion, an ideal party starter, and the most reliable post-breakup buddy. Yep, pizza does it all. But as versatile and delicious as it is, you can’t indulge in it at every opportunity (even though your taste buds may say otherwise). 1. 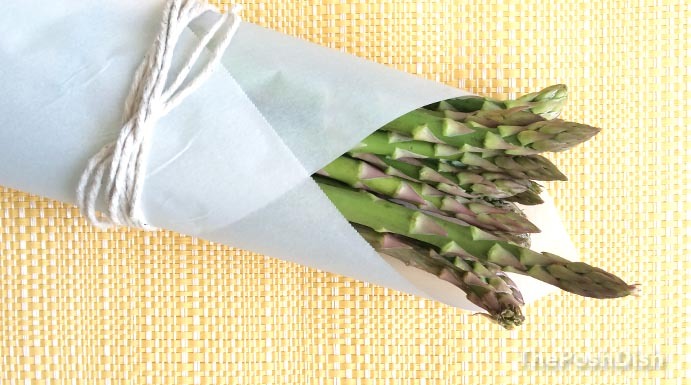 Sautee your washed and sliced leeks over medium heat until softened, and steam your asparagus until bright green. 2. Preheat the oven at 350 degrees. 3. 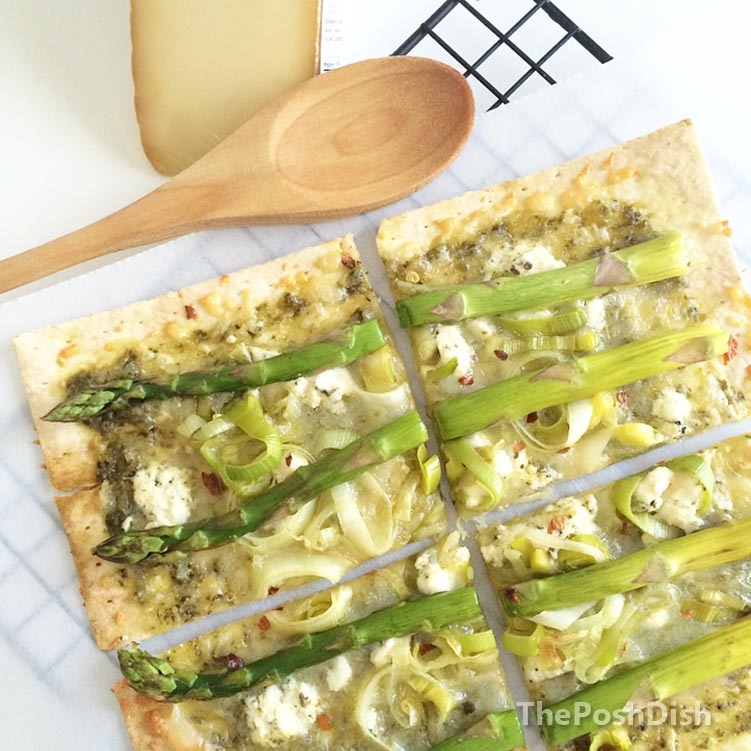 Lay out your flatbread on a baking pan, and start layering the ingredients. Begin with a coat of basil pesto as your base, then the goat and mozarella cheeses, the leeks, finally followed by the asparagus. Sprinkle the salt on top. 4. Pop in the oven for about 8-10 minutes, take out, and let it cool before indulging. If you’re one who can handle the heat, sprinkle a few red pepper flakes for an extra kick! They definitely add a nice layer of flavour to an otherwise mild recipe. With the beginning of a new year, many people may resolve to eat better, healthier, and more nutritious foods. Of course, all goes well until one craving creeps up and threatens to spoil all that hard work and progress. So how do you stay on track? Well, you can start by being more selective with your snacks. Instead of reaching for that sugary granola bar, or salt-loaded chips, there are healthier options to choose from. And that doesn’t mean you have to sacrifice flavour! All of the alternatives below are just as tasty. 1. Quinoa Chips: We all love Doritos, Cheetos, and the crunchy goodness of chips. But when you turn that bag around and take a look at the nutritional information, everything you munched on doesn’t seem to settle quite so well anymore. Fear not, there is something else you can eat that tastes great –quinoa chips. They’re so good you can’t even tell the difference, and are relatively low in fat and sugar. And it goes without saying, you’re getting the benefits of ancient grains. 2. Rice Cakes: Bread, baguettes, and buttery croissants may be a nice treat once in a while. And once in a while is key. 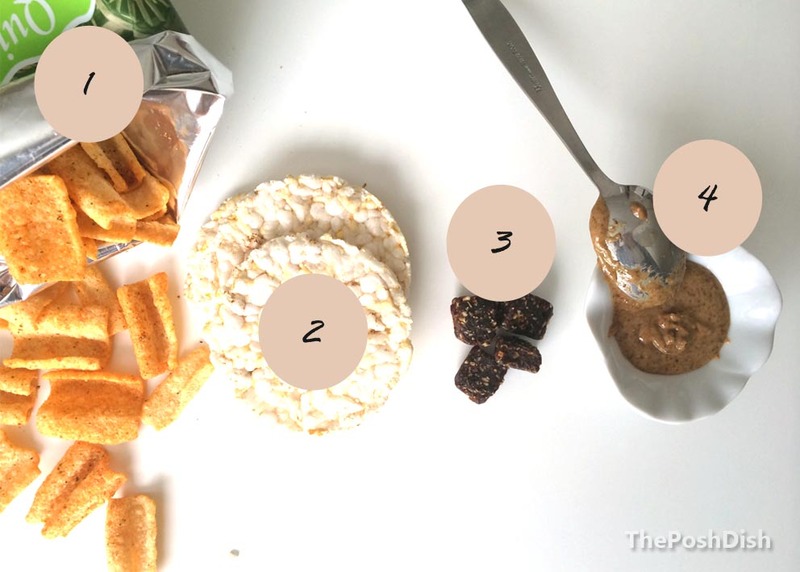 If you like to have bread on the regular, and with almost every meal, then you may want to consider switching over to rice cakes instead. Choose organic, multigrain ones instead of the Quaker kind –with only 75 calories for 3 pieces and only 0.5 grams of fat, they are ideal for pairing with any kind of nut butter and fruit. Whole Foods or you local health food store should have them! 3. Hazelnut Butter: Nutella. If reading that made your heart beat faster, you’re not alone. We all love to eat it, until we’ve reached the bottom of the jar and the peak of regret. A great (and guilt-free) alternative is hazelnut butter. It’s unsweetened, but spread it on top of a rice cake, and drizzle it with a little honey or a few semi-sweet chocolate chips for a fantastic breakfast! 4. 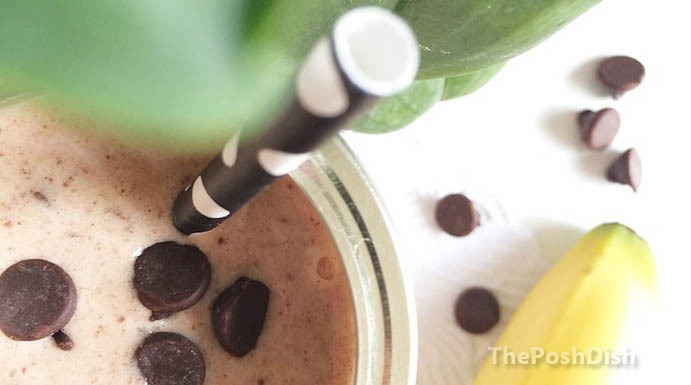 Banana Bites: If you’re in the mood for something sweet, stop yourself before devouring that chocolate bar. The coconut banana bites by Barnana are equally delicious, and help you get your serving of potassium. Not to mention, they’ll help kick that sweet tooth craving to the curb. And there you have it, the best alternatives for your favourite foods and snacks! Have you tried any of these? Which did you like best? Do you have any other substitutes and alternatives to suggest? 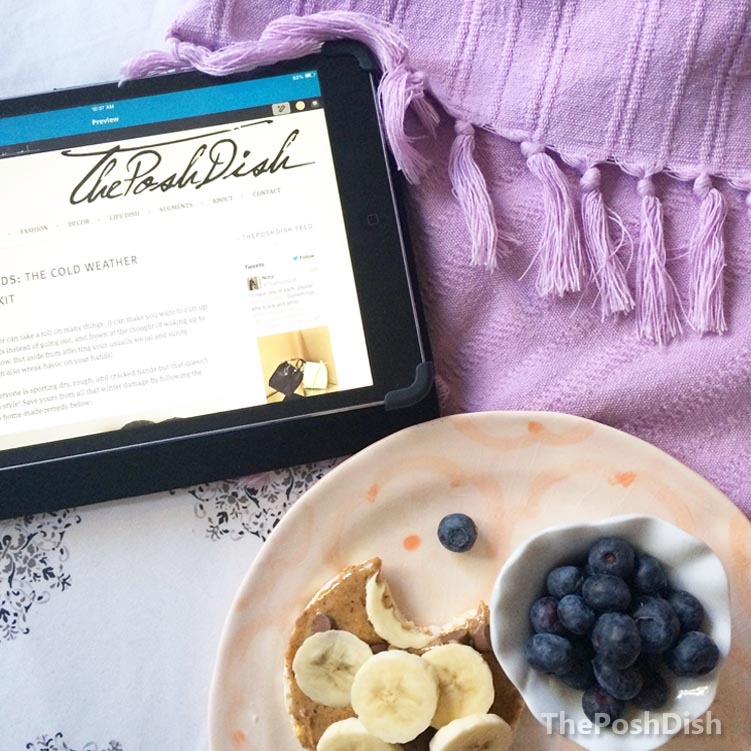 Leave your thoughts in the comment section or tweet @ThePoshDish! Score a touchdown with the crowd at your Super Bowl party by making delicious crostinis. Sure, you can serve the regular chips and dip, but where’s the fun and flair in that? These bite-sized snacks are a deconstructed version of everyone’s favourite Mexican treat(guacamole), artfully presented in layers. Not to mention, they are a fresh alternative to all the fried, calorie-clad, and sugary snacks you’re going to be tempted by! 2. 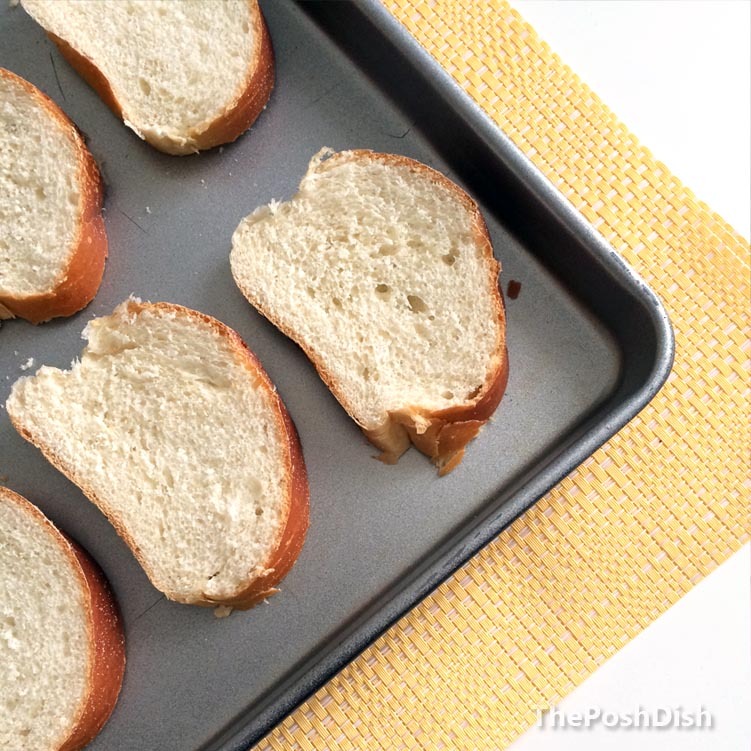 Slice your baguette 1/4 inch thick and place the pieces evenly across a baking pan. Brush each of them with olive oil. Put them into the oven for approx. 10 minutes or until they become golden and crisp. 3. Prepare the vinaigrette by combining the remaining olive oil (2 tbsp), juice of 1/2 lime, salt, and minced cilantro. Stir until well combined. 4. 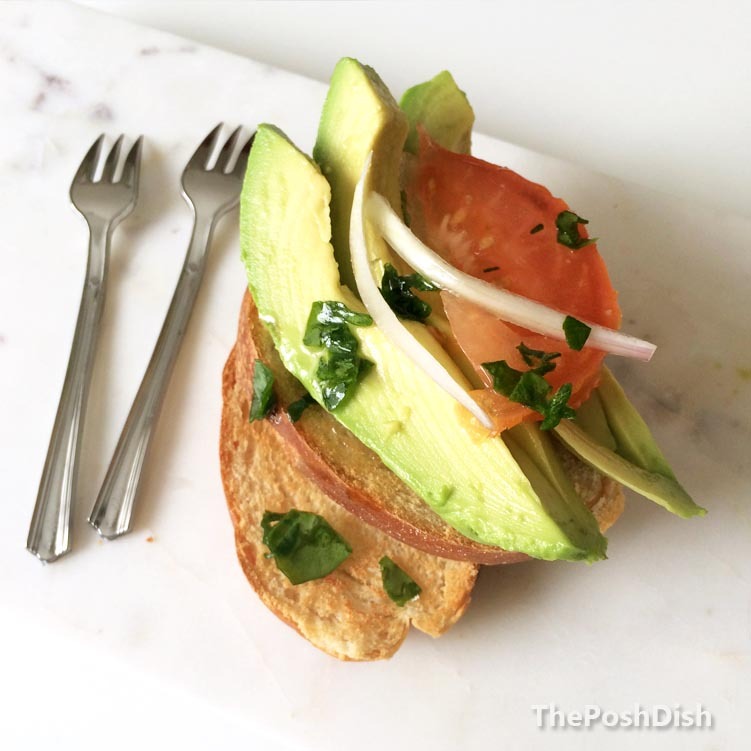 Slice the avocado, tomato, and shallots. Lay one on top of the other on the freshly toasted baguette slices. Pour a tsp of vinaigrette on each, and enjoy! Soup and warm foods are a dietary staple during the frigid winter months. Sure, a salad may be a fresh treat for your taste buds, but stick to eating it in the spring and summer. When snow flakes are falling, it’s wiser to fill up a bowl of soup instead. 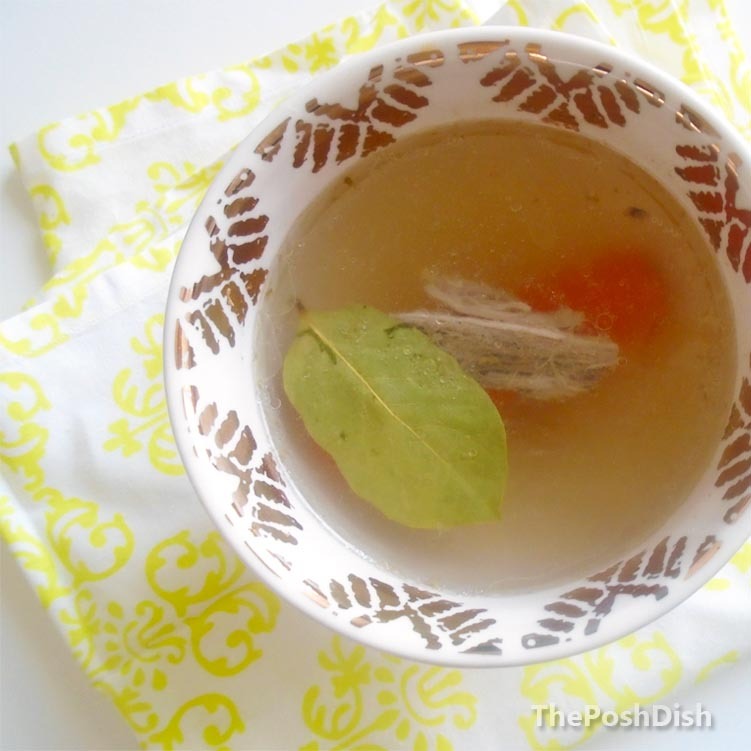 The latest craze this season is bone broth. Grandmas around the world have been brewing up pots of if for generations, and it seems like kitchen-savvy gals are finally taking notice. And how could they not? It’s tasty and not too hard to make. Plus, it has a ton of health benefits that could help boost your immune system and load up on vitamins. So if all this sounds appealing to you, strut over to your local butcher shop, pick up some fresh ingredients, and start cookin’. Scroll down for the how-to! 1. 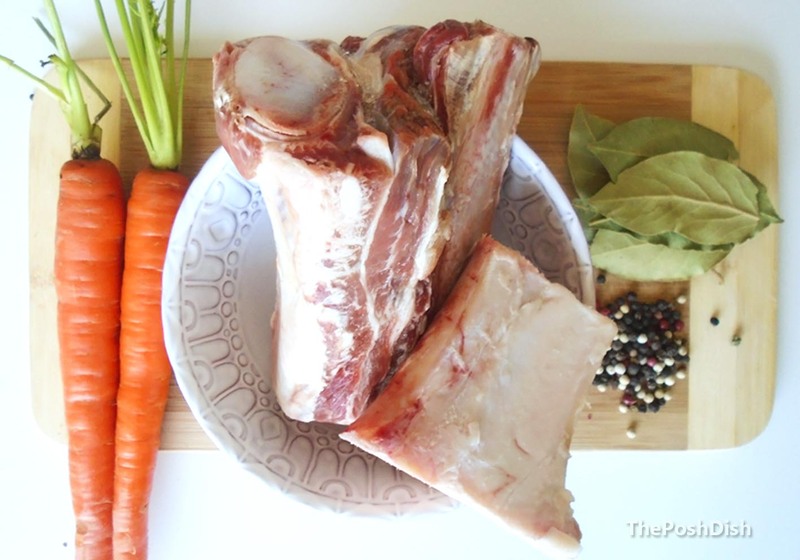 Prep all your ingredients, and rinse the bones under cold water. 2. Add the bones to a large pot, and fill it with water approx. 2-3 inches above the bones. Let it boil on high heat, removing the foam that will form at the top with a dense strainer. 3. After 10 minutes of boiling, turn the heat down to medium. Then add the carrots, peppercorns, bay leaves, and salt. 4. Cover it with a lid and let it simmer for another 1 1/2 hours, and you’re ready to start sipping! So whether you enjoy it as it is, or use it as a base for another savoury soup, give this latest trend a try!